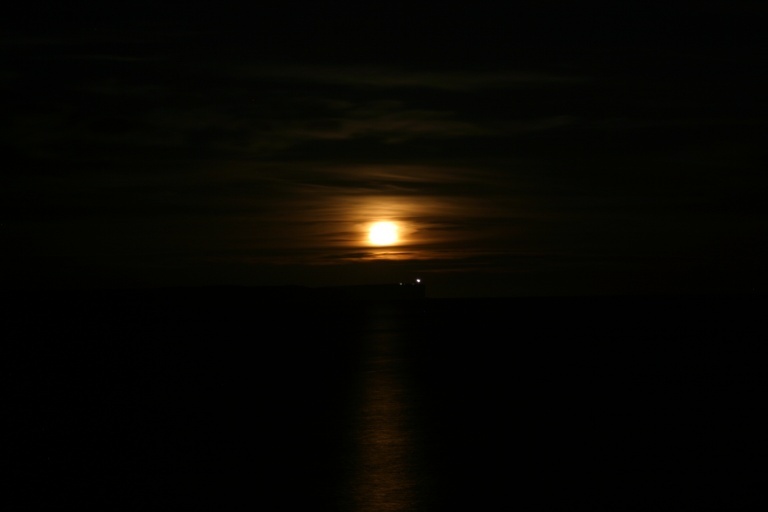 A case study in negativity..
A photo of the moon rising over the lighthouse at Point Perpendicular, Jervis Bay. What is the worst thing that can possibly happen to a positive thinker? To be partnered with a master of negative thought. The Other Half is not negative all the time, but certain situations are bound to produce pain for all. Today has been quite a painful day. When we left the car people last night, they told us they would call “by lunchtime today”. Having been in sales myself I know that if you give a customer an expectation like that, you better follow through and deliver. Having the partner I have, a helpful note for the future is – tell them if they don’t call, it’s going to result in a horrible chain reaction of doom and gloom in my household, and I’ll call off the deal just because of the pain I have suffered due to them telling The Other Half they would ring, and then not doing it. So here’s what happened – it’s been a day of The Other Half making stupid assumptions and me wanting to beat him up because of his negative thoughts. Just before we left at 11am, The Other Half discovered a funny icon on his phone. When he checked out what it meant, it seems his mobile phone had disconnected itself from the network. For all we know, it had been like that all morning. There was still an hour till lunchtime and no message on the phone, so The Other Half assumed they had not called. 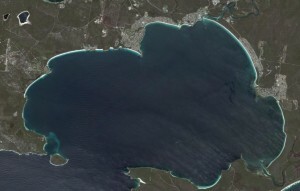 We drove off to Jervis Bay to see the real estate people and how is this for ironic? The house we’d pretty much decided on renting was rented yesterday. So had we not gone car shopping.. clearly it was not meant to be. But another house we’d driven past before but crossed off the list because it was for sale was now off the market and rental only. This house was just seconds from the beach and backed onto a reserve with trees and wildlife. I would be able to put out a bird feeder. We arranged a time to go see it in a couple of hours, and headed off to drive past it one more time, check my PO box and have lunch. When we drove past it looked small from the outside but we figured we’d take a look because the location was so great. As we were driving back from the PO box, it was now mid-day, and the other half said to me “It’s lunch time and they haven’t called”. I could hear the negative thoughts in his head – things like “the finance has fallen through and they don’t want to call and tell us” “they can’t find us a car” and various other negatives. I said “maybe they have lunch mid-afternoon” and told him to quit doing that negative self-think that he always does, and why doesn’t he just call them himself? We went back to look at the house. Everything about it was perfect, except for the fact that it was too small. For two people we have a lot of stuff. I could see my dream of living close to the bay slipping away.. for today at least. We went to see the other agent and they have a couple of options, I’m waiting for a phone call to line up times to see them. I can’t explain this urge to live near this bay to anyone but it’s like a silent screaming inside of me. So by this time it’s almost 3pm, and The Other Half complains of a headache and that he was feeling like he was coming down with something and he just wants to get home. By the time we got home his mood had gone from not feeling well to complete doom and gloom. Still no phone call. In his mind the deal has completely fallen through, and to make matters worse I’m mad at him because I know what he’s doing to himself. He knows it, too. He knows I get pissy when he does this dance of negative self talk. I say “Just make the phone call already!” He prefers to sit and dwell on how things have all turned to shyte. He does this for an hour. I am sure I have mentioned before that The Other Half suffers from Call Reluctance. That’s when you don’t want to make a phone call for fear of hearing what they’re going to tell you. At 4pm he finally makes the call. What do you think he was told? Everything is fine. They think they have found a car but they have to wait till tomorrow for confirmation. The finance is all approved and it was yesterday when we left, it’s just something the finance guy had to sort out on his end. No doom, no gloom. Just his negative self talk doing his head in – and mine by proxy. Of course he feels better now and the headache miraculously vanished as soon as he got off the phone. If he’d made that phone call earlier, think of all the suffering he would have missed out on! This post got in the way – I was going to write about Feng Shui and Aromatherapy. I’ll take a bit of time to put that one together now because I’ll try and put in a few easy Feng Shui basics ;) and tomorrow is Hump Day Hmmm..